Banner advertisements are an effective way to reach your target market. 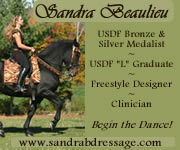 If your market is related to the sport of Dressage, then DressageMarket.com could be the place for your banner advertisement. There are several options to choose from when advertising with us including: size, placement, duration and pricing. If you have any interests or questions please feel free to fill out the form below and we will respond in a timely manner. Click here for our Banner Advertisement Information PDF. To contact us via e-mail concerning advertising on DressageMarket.com, please complete the fields below and click Send.